My card today was a super simple and quick card to make. I used some copper embossing powder on the corner of the card base, added a wreath and some twine as a ribbon and it was done – see – easy! Today my card is based on a sketch from the Clean & Simple #41 challenge. CAS style cards are right up my alley as I really like having white space to rest my eyes and draw my attention to the main element on the card and as you can see in this sketch the trio of circles at the top certainly draw your eye to the focal point. I used the circles to create little peek-a-boo holes for Santa to look through. This really was a super quick card to make. I already had the Santas fussy cut out, so it was just a matter of punching the holes, stamping the sentiment and then assembling the card. I’m trying to build up my Christmas card stash at every opportunity I get and sometimes it’s fun to make a card with no stamping and don’t you think that sponging is rather relaxing. 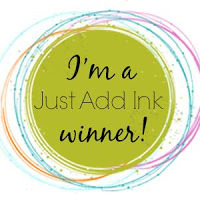 The current challenge over at AAA Cards #102 is all about ink blending and inspired my card. To create my scene, I masked off a circle to represent the moon and then used inks from Stamping Up to sponge the night sky. I die cut the sleigh and trees and placed them over the sky piece and I was done. It’s not a traditional CAS card but maybe the night sky gives the illusions of white space? I love making cards to show my friends that I appreciate them and the current challenges over at CAS(E) this Sketch #246 and Just Us Girls #418 fit the bill to inspire my design. I love the ink smooshing technique so took my ink pad and smooshed it onto my craft mat, spritzed it with water and then dabbed my card front onto it until I got the effect I wanted. I then added some vellum die cut vine leaves, sequins, the sentiment and mounted them on some cardstock and glitter paper and hey presto my card was made! Today I’m combining 2 challenges – one from Seize the Birthday toppings challenge to use a kraft card base and the other from Tic, Tac, Toe #022 where I chose the diagonal of stripes, ribbon & layers. You can’t beat this recipe for a great masculine card. I took a bit of liberty with the ribbon idea where I pleated a piece of DSP to look like a piece of pleated ribbon. I needed a birthday card for one of my nephews so went to a stamp set for a boy who loves music – Reverse Confetti ‘Inner Rock Star’. I stamped the guitar and records then fussy cut them out, stamped the sentiment on to a banner, used the eraser end of a pencil to create the white dots for the background and then layered all the components with dimensionals and stamped the musical notes for a finishing effect. Misc paper scraps from my stash. So by now, you’d realise that I play along with a lot of challenges – why? – well I’m super busy with work and all the activities that my daughter is involved in so when I find that small bit of time to get crafty I often find myself just sitting there lacking inspiration. So I go to my list of challenges for inspiration, many times I combine 2 or 3 as the thinking in done for me. They might be a sketch, colour scheme or a theme – so I then just grab the relevant items and I’m off. It’s a great way to create when you may only have 30 minutes free and lack ideas. I’m on my 3rd month of playing with the Gerda Steiner image challenges and this month we get to use her Balancing on ornament mouse digital image. He is adorable and I had so much fun colouring him in with my Stampin Up Blends. I also used a sketch from Freshly Made Sketches #311 to help me with my layout design. Up next is a card for a challenge for the Watercooler Wednesday Challenges #143. The challenge was an anything goes feminine card. I was asked to make a fun card for a little girl and I’ve been wanting to try out a blackboard style card and I think it fits in nicely with this challenge. I made the actual blackboard by cutting and gluing the frame around some plain black cardstock. I used twine to tie it all together like a real blackboard. Today I’m playing along with a challenge by SUO Challenge #186 – Treats of All Kinds.